Today’s delicate ribbon or border tangle, 3-loops-6 is another one from CZT Mina Hsiao, and it’s also a very simple continuous line tangle. 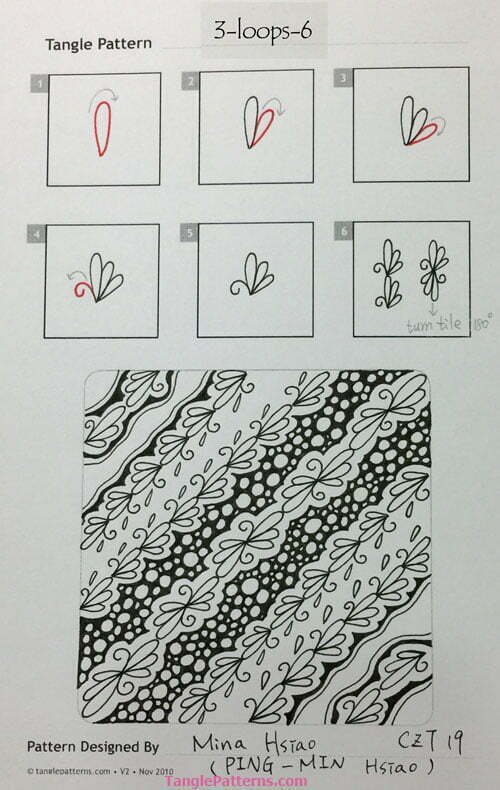 Mina says 3-loops-6 developed when she was drawing the Zentangle®-original Eke tangle. This tangle’s name conveniently tells you how to draw it! 3-loops-6 starts with three graduated loops ending at the same point, then the number 6 originates from that point. It’s easy as pie to draw and Mina shows several ways to embellish it with auras and tear-drop shapes for a very pretty lacy effect. I added just a touch of graphite shading to my example, and my 6’s are a little on the curly side just for fun. A note on shading. Sometimes when I’m using my tortillion, the graphite-loaded tip blends graphite into a white area where I did not plan for it to go. I’ve fallen in love with this great little tool from Tombow. It’s called a Tombow Mono Eraser, and it’s built like a mechanical pencil so you can retract or extend the tiny eraser at the tip. 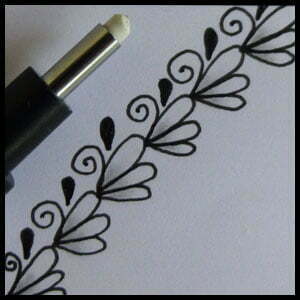 The eraser gets into the smallest of spaces, which is usually what we’re dealing with in Zentangle®. In all other cases there’s no eraser in Zentangle, but to tidy up a little shading “overflow” in tight spaces the Mono Eraser is just the ticket for me. And here it is with the rest of my Zentangle tools. BTW, I do have a much smaller tortillion that I use too but I prefer the comfortable size and the blunt tip of the large one, so that’s why the Mono Eraser comes in so handy. 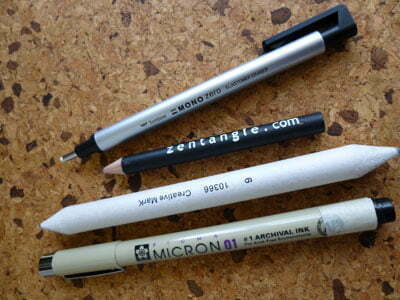 Tools of the Zentangle Trade – the Tombow Mono Eraser is shown here at the top. Note the masking tape on the end of my Micron. I mark the tape with the date I begin using each one so I can easily locate my “freshest” 01. Another tip (originally from CZT Suzanne McNeill, if memory serves me correctly) is to use colored tape to distinguish between different sizes of pens. Mina illustrates the step-by-step instructions for drawing 3-loops-6 below. Image copyright the artist and used with permission, ALL RIGHTS RESERVED. You may use this image for your personal non-commercial reference only. Republishing or redistributing pattern deconstructions in any form including pinning is illegal. Click the image for an article explaining copyright in plain English. 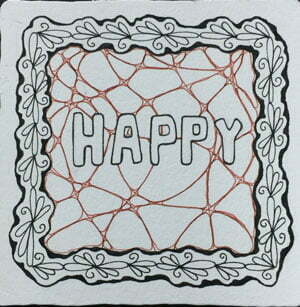 Here Mina’s Zentangle tile features 3-loops-6 used as a border or frame around the Zentangle-original tangle ‘Nzeppel. Check out the tag minah for more of Mina’s tangles on TanglePatterns.com. I love this new chain…thank you very much! Some great tips on this post, Linda, and a very pretty tangle. I’ve never thought of using a small eraser for tidyng up shading. I’ve got an electric one (battery driven) and a sharpen-able pencil-style eraser, and my propelling pencils have small erasers on their ends, and I use these for other types of drawing. I love the look of the Mono eraser and must see if they are available here in the UK. I also wrap masking tape around my pens, but cut it so that the thickest pen has the full width of tape, and the finest, the narrowest strip of tape, to distinguish between them. I had not thought of writing the date on them, but that’s a very good idea! Thanks for sharing. Good idea using varying sizes of masking tape to distinguish pen sizes, Shoshi. I pretty much just use the 01, so that’s not an issue for me. If you’re not a colored-tape person, buying a whole roll for a pen or two isn’t on, but I’m sure many scrapbookers and art journal people have a treasure trove of colored tape handy and for them, that’s another good way to go. I usually just use a medium sized pen for Zentangle, too, Linda, but I use my pens for mixed media and other things too, and I have a lot of different ones in a box together. The tapes make it really easy to find the one I want. Actually it was my hubby’s idea to stick on the tapes with different widths – he’s not just a pretty face lol! I am new to tangling and finding it fun, interesting and challenging. I very much appreciate your work and your helpful advice. Thank you. I really like this “ribbon”. I too like continuous line patterns. They can lead so many directions. Thanks for this beautiful tangle. Nice continuing border or chain. It may become a favorite as I like the loop effect and the frill of the 6. Really like this one. I am a quilter and am using my Zentangle to machine quilt. This continuous flow makes this a good one to use in quilting. Hi Sandra, many tanglers are also quilters so you are in good company. Be sure to check out the tag “continuous line” for all the tangles on the site you might enjoy for quilting. I love this pattern so much! It’s gorgeous in all the variations I’ve tried so far. Thank you Mina and Linda! Thank you for this pattern! I love loops!